It’s already been a pretty wild off season in the NHL with lots of big names changing teams. As we are in the dog days of summer, we might as well get prepped for the 2016-17 season and discuss the fantasy impacts of all these moves. I introduce to you Offseason Fantasy Quick Hits. I will be discussing the fantasy impact of all major moves made by all NHL teams over the course of the summer. Part fourteen of the series previews the Ottawa Senators for this upcoming season. It hasn’t been an overly busy offseason for the Sens, with the exception of the Mika Zibenejad for Derick Brassard swap. The Senator’s core players are in or entering their prime years, therefore they believe that they will improve upon last year, when they finished 11th in the Eastern Conference. I somewhat agree, as the Eastern Conference is wide open this year, and I think they will be competing for a playoff spot this year. The first line of Kyle Turris, Mike Hoffman and Mark Stone have been pretty solid for the last two years now and I’d expect more of the same this year. Mike Hoffman has shown he can score 30 goals in this league, the question is can he up his game to the point where he can score 40? I don’t think he is consistent enough, but if he can manage to minimize his cold streaks he’s been known to go on in the past he has a chance. For now I’ll peg that line around the 65 point mark for each of them. Turris and Stone are likely to continue to score around 25 goals. They are all draftable at the mid-way point of your draft, but I wouldn’t reach on these guys. Bobby Ryan has become more of a 2nd line guy since hes arrived in Ottawa from Anaheim. He hasn’t hit 25 goals yet in 3 seasons after he hit 30 goals 4 times in Anaheim. He has always been a guy that has a pretty reputable name, probably because he used to play with Getzlaf and Perry and because he was the #2 draft pick after Sidney Crosby. He’s a safe bet for 20 goals and 55 points, but I don’t think his ceiling is much higher. He did show an ability to dominate games at various points last season but I don’t think its enough for me to draft him this year. Therefore, let someone else take a guy with a big name with only 2nd line production when there are probably higher ceiling first liners still left on the board. If he falls later in the draft I don’t mind him as a safe pick. Erik Karlsson is the #1 Offensive Defenseman in Fantasy Hockey. He likely is a first round pick this year. 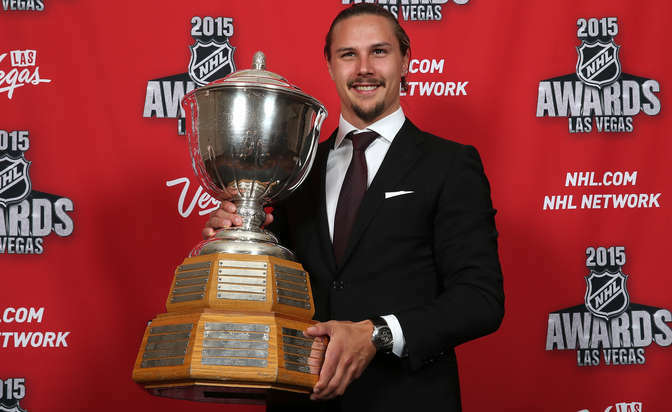 Erik Karlsson is the best fantasy defenseman in the league and everyone knows it. After 82 points in 82 games last year, he is likely a first round pick. I generally don’t like taking d-man that high, but I think Karlsson is an exception to the rule. He should lead the team in points again and he is at a prime age to be putting up points. As 80 point d-man are nearly impossible to find these days, I like him from a value above replacement perspective, meaning he’s that much better than every other defenseman in the league, so if you get him, no one else will have a defenseman quite like him. If you manage to draft him and do well drafting the rest of your team, you may give your team that competitive advantage needed to win your league. Maybe Derick Brassard clicks with Bobby Ryan on the 2nd line, and maybe he doesn’t. Still he hasn’t proven to be more than a 60 point guy, so draft him as such. I’d probably lean towards staying away, but if he fell in my draft I’d consider him. Other than that, there’s not a whole lot of fantasy relevance from the Sens. Dion Phaneuf looked pretty good over a small sample size for the Sens. I do think he will perform much better than he did in Toronto with less of a role and expectation, but I still don’t expect him to go back to nearly 20 goals and 60 points. I think 40 points is a best case scenario, with 10 of those points being goals. Still, he feels more like a 6 or 7 goal, 35 point defenseman to me who can put up shots and a decent +/-. I don’t hate it if you draft him late. Cody Ceci is still young, and I think he can put up 30-35 points this year, and maybe even more but unless your in a deep league he’s probably a watch list guy for now. Ditto for Curtis Lazar. I’m not sure he’s at the point where I’d say draft him, but he is talented enough to be fantasy relevant with the right opportunity. Other prospects like Logan Brown, Thomas Chabot, and Colin White aren’t ready to break into the NHL and be fantasy relevant yet, but keep an eye on them down the line. Lastly, if Craig Anderson can stay healthy, I really like him this upcoming year. He played 60 games last year and won 31 of them. While his ratios were average, I’d expect the Sens to be a bit better this year with the minor improvements they’ve made, and a year of further progression from their core players. I like him as your 2nd goalie this year, but don’t count on him to be your number one.